1- 2015, Swistek AB 42, with a bar capacity of 1.50 inch diameter. 1- 2013, Swistek RB20, with a bar capacity of .750 inch diameter. 1- 2017, Swistek RB20Y, with a bar capacity of .750 inch diameter. 1- 1992 Citizen VII 16 with a bar capacity of .625 inch diameter. In order to provide such a vast array of services, we have to be proficient in working with a variety of materials. 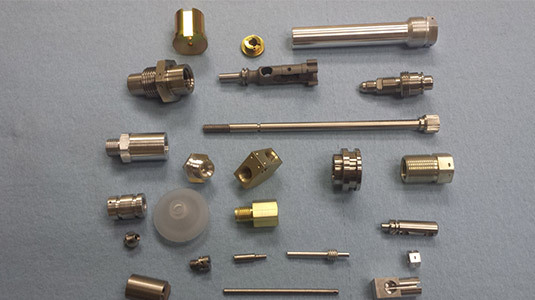 Among the materials we regularly manufacture parts from are numerous varieties of stainless steel, copper, brass, monel, titanium and various plastics. An additional aspect of our work, particularly in highly regulated industries, involves abiding by certain important quality control specifications. We also work with a variety of software in designing and manufacturing the parts our customers need. For high quality machine parts, or when you need someone who can operate a CNC milling machine in San Jose, CA expertly, call JNC Machining, LLC at 408-920-2520 to learn more about why our customers have made us their top choice for parts in the area. CNC Screw Machining: JNC Machining prides itself on our high quality products and offer affordable and prompt turn around for custom screw machining for our clients in San Jose. We work with metals such as steel, stainless steel, brass, copper, aluminum, and much more. We have all the necessary screw machining equipment and knowledge to fulfill anything you require. Contact us today with any questions about your order.